Using reduced apple cider as a base to cook the apples in this recipe creates an amazing apple caramel sauce. Be sure to serve this dessert in a bowl so you can baste some of the gooey, delicious sauce over the apples right before serving. To select the correct apples for this recipe, be sure to choose the type that holds up well during baking. According to Bon Appetit magazine those very best apples are Honeycrisp, Pink Lady and Mutsu or Crispin. Pour the apple cider into a medium sauce pan and bring to a simmer. Continue to simmer for about 15 minutes until the cider has reduced to one cup. Remove from the heat and set aside. Slice a small piece off the top of the apples and using a spoon carefully scoop out the core in the center of the apple and make a small “bowl shape”. Be careful to not cut through the apple sides or bottom. Discard the flesh and seeds. Place in a pie pan or shallow baking dish and drizzle the apples with lemon juice. To make the filling, combine together the flour, raisins, sugars, salt, cinnamon, nutmeg and nuts in a small mixing bowl. Using your fingers, combine the butter into the sugar mixture until well incorporated. Pack the mixture into each apple allowing any extra to fall into the baking dish. Sprinkle any leftover filling on the apples. Pour the reduced apple cider into the bottom of the baking dish and bake until the apples are cooked through. Depending on the size and variety, the apples should bake in about 40-55 minutes. While baking, baste the apples a couple times with the cider sauce. When a small knife moves smoothly through the apples remove them from the oven and cool down until still just warm. 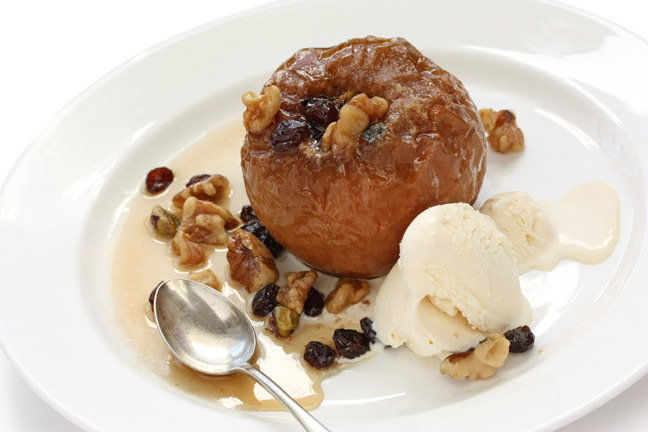 Serve warm apples with the cider sauce and vanilla ice cream, gelato or whipped cream.